Divided back, unused Real Photo Postcard. 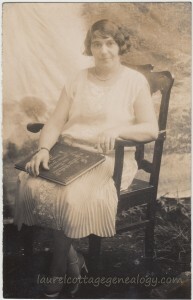 Circa 1920s. NOKO stamp box. According to the obituary information posted on Find A Grave, Ethel O. Shore was born March 5, 1905 in Arlington, Kansas, and died June 8, 1969 in Dodge City, Kansas. She married William Powell Cockey, Jr. on June 6, 1928. She worked as a nurse’s aid, was a member of the First Christian Church in Dodge City, the American Legion Auxiliary, and the Ford County Heart Association Council, and she worked with the Red Cross. 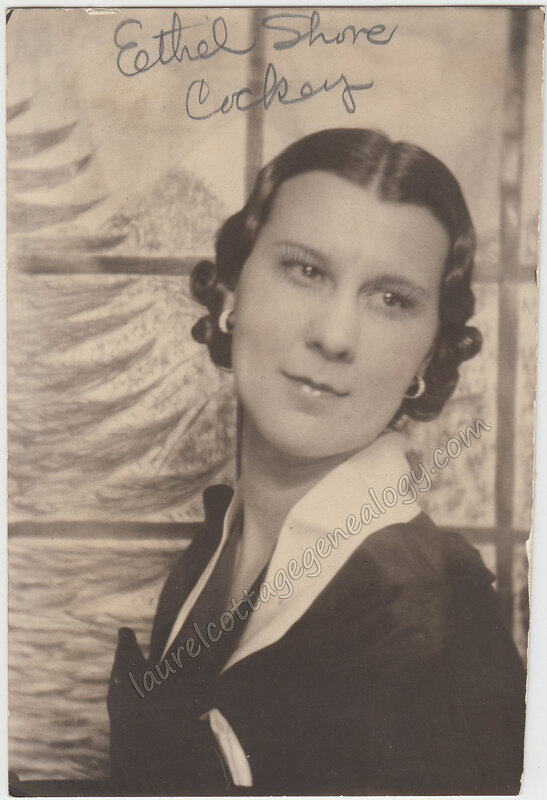 Ethel would have been 23 when she married, and this photo could have been taken either before or after her marriage, and it’s probably from the late 1920s or early ’30s. The background is interesting. It looks like she was posed before a piece of artwork that was drawn to have the viewer looking out a paned window to an outdoor scene, but is that a tree on the left or is it water at a shoreline? If you look closely at the photo you’ll notice that Ethel’s eyelashes were enhanced by, it would seem, the same person that wrote her name at the top. Perhaps this was the photo artist but whoever it was did a good job. Ethel Olive Shore is on the 1910 Federal Census taken in Arlington, Kansas with her parents Victor H. and Ella M. Shore. Victor’s occupation shows here as Foreman for a “Section Gang” and this is likely referring to railroad work, as his WWI draft registration card shows Victor Hugo Shore, Section Foreman for the A.T. & S.F. Railway Co. (Atchison, Topeka & Santa Fe) in St. John, KS. The 1920 census taken in St. John shows this family with an additional member, Myrtle, age 9, and a boarder, Jessie Smiley. Old photo, circa late 1920s or early 1930s. “United States Census, 1910,” index and images, FamilySearch (https://familysearch.org/pal:/MM9.1.1/M2ZW-TGX : accessed 27 Oct 2014), Ethel Olive Shore in household of Victor H Shore, Arlington, Reno, Kansas, United States; citing enumeration district (ED) 146, sheet 11B, family 77, NARA microfilm publication T624, FHL microfilm 1374466. 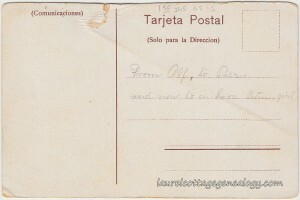 “United States World War I Draft Registration Cards, 1917-1918”, index and images, FamilySearch (https://familysearch.org/pal:/MM9.1.1/K66V-YHD : accessed 27 Oct 2014), Victor Hugo Shore, 1917-1918. “United States Census, 1920,” index and images, FamilySearch (https://familysearch.org/pal:/MM9.1.1/MFXG-W25 : accessed 27 Oct 2014), Victor H Shore, St John, Stafford, Kansas, United States; citing sheet 7A, family 62, NARA microfilm publication T625, FHL microfilm 1820552. I don’t know why, but I’m always surprised by the seemingly endless amount of different lettering styles that show up on old postcards, miscellaneous cards, and the like. Delighted though, to be sure. This one is no exception. Love the way the “o’s” overlap in “soon”, the rounded “w”, the dots added between the words, and the “n”, although the “n” in “confess” is different. I guess the ink got filled in on that one by mistake. 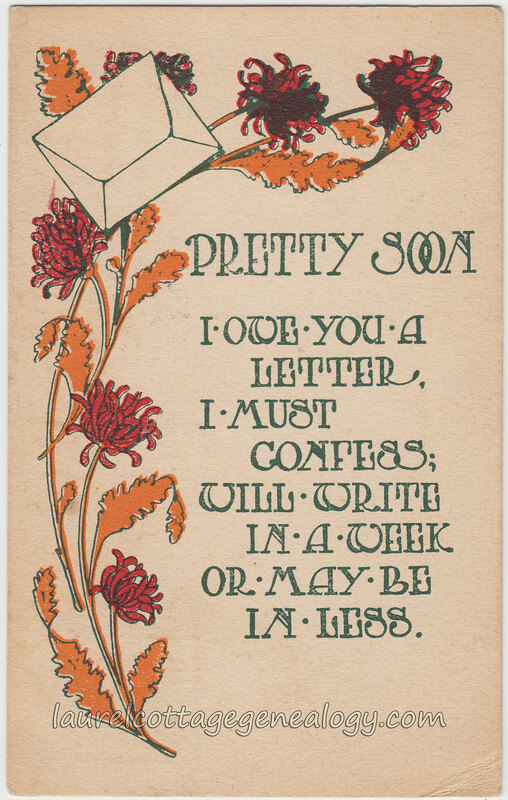 Anyway, this is an Art Nouveau style card, as you can see by the flow-y lines of the few sprays of flowers and leaves, (timely for fall colors right now) and is also unmistakably Art Nouveau in the beautiful postcard header on the back of the card. 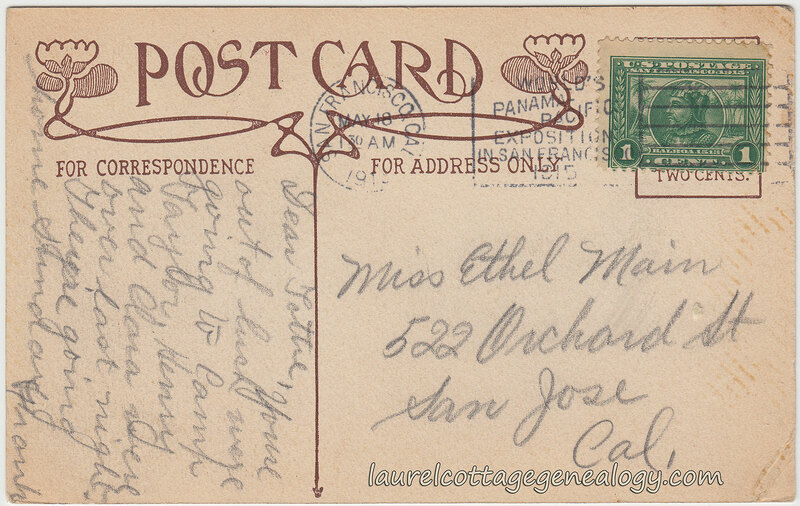 This is the first in a collection of postcards that are addressed to Ethel Main. Camp Taylor that is mentioned in the message to “Lottie” (or is that Lettie?) is today Samuel P. Taylor State Park, located in Marin County, about 30 miles northwest of San Francisco. Samuel Penfield Taylor, was a successful gold rush ’49er, who purchased 100 acres along Lagunitas Creek for the whopping 😉 price of $505.00 in 1855. Imagine paying $5.00 an acre today! On this land, Taylor set up the first paper mill on the West Coast. The full history of the park is really interesting. Check it out here: Samuel P. Taylor State Park. Divided back, used postcard. 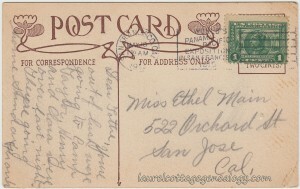 Postmarked May 18, 1915 from San Francisco, California. Publisher unknown. Source: Samuel P. Taylor State Park. Marin Conservation League. Web accessed October 26, 2014. 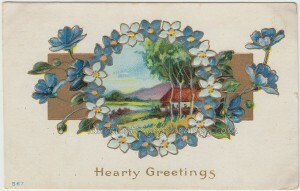 Here’s a beauty sent from Arapahoe, Nebraska in 1913, carrying a message of “Hearty Greetings.” This postcard is embossed and shows a little scene of a cottage by a lake or river, with some purple hills and a blue sky in the background, framed by a wreath of alternating dark and light blue forget-me-nots, with some larger blue flowers happily appearing out from the sides. Underneath it all is a gold-tone rectangular bar. 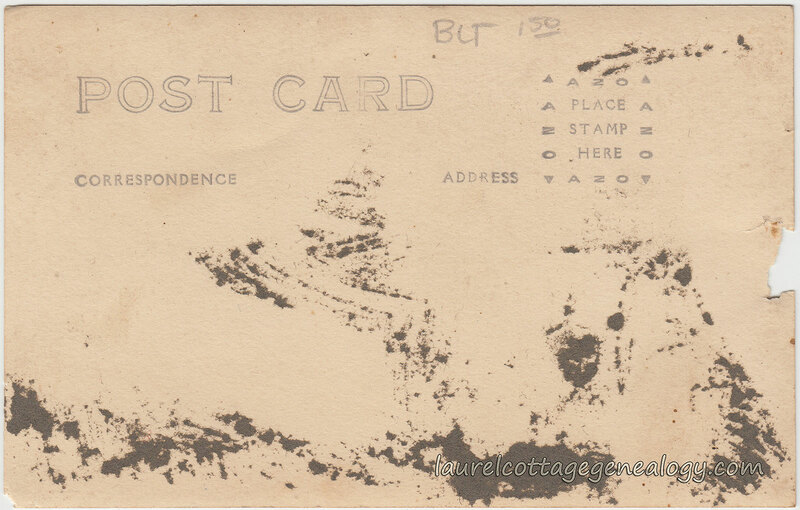 Divided back, embossed, used postcard. Postmarked August 26, 1913 from Arapahoe, Nebraska. Publisher unknown. Series or number 567. “Una de las islas del archipiélago de San Blas, República de Panamá. Palm trees, thatched roof buildings, a few natives, and a beautiful beach at the “puente del mundo, corazon del universo” – bridge of the world, heart of the universe. 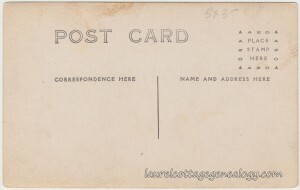 Divided back, unused postcard, circa 1960s. Mirro-Krome Card by H.S. Crocker Co., Inc., San Bruno, California, 94066. 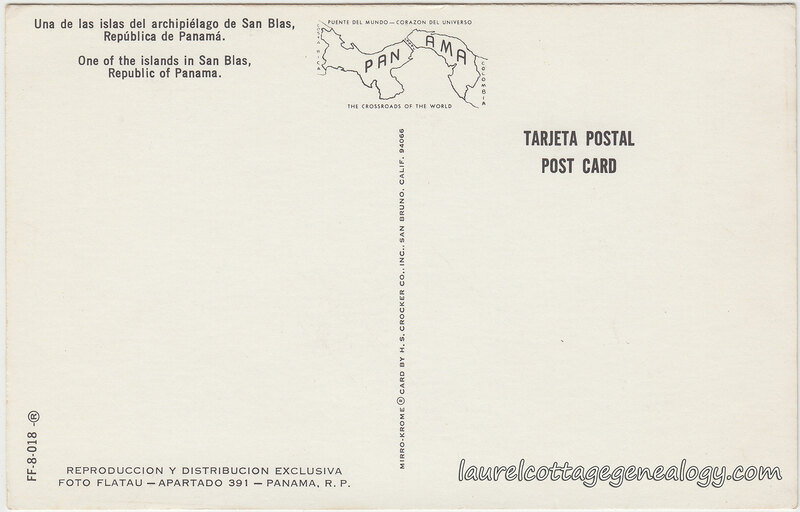 Reproduction Y Distribution Exclusiva Foto Flatau – Apartado 391 – Panama, R. P. Series or number FF-8-018. 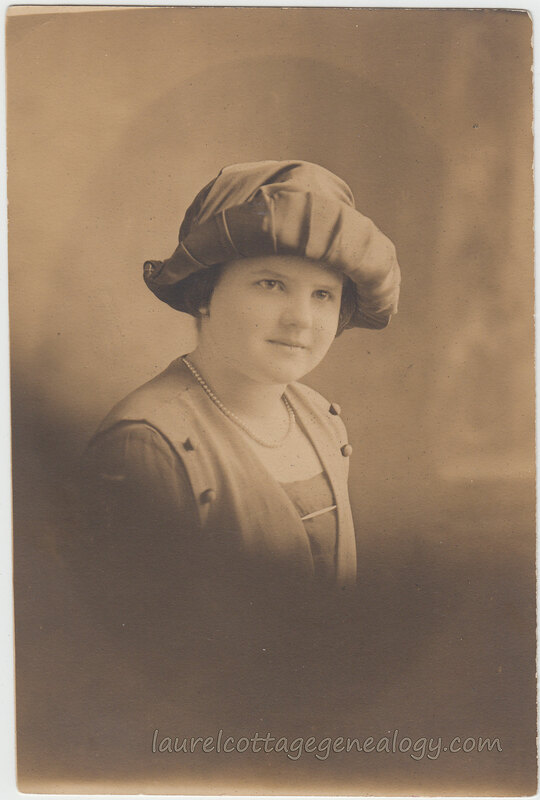 Studio photo of unidentified girl, circa 1920s. Size: 4 x 6. Here’s a charming studio photo of a beautiful little girl, perhaps around eight to twelve years old. How to describe her hat? Well…cloth, perhaps satin or silk, with a turned up brim, much larger in the front, with pleats or folds. The crown’s material is folded over to the side….The perhaps square neckline on her dress or blouse shows under a vest of a lighter color that has two decorative cloth buttons at the shoulders. She wears a short pearl-type necklace and probably matching earrings. Her hair is either short or pulled up under her hat, she has a direct gaze and wears a slight smile. We can clearly see that this photo was at one time in an oval frame. Back to this hat…this particular style wasn’t showing up while browsing online through all manner of hats for girls and women. One thing is clear on the subject of hats – the styles are limited only by the imagination. What one could dream up, one could make or have made. This photo is estimated to be from the 1920s. 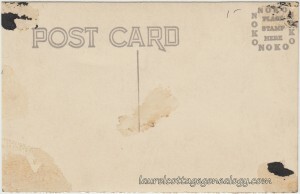 This is a tinted postcard that was produced from a photo. The exact same photo of this street in Antofagasta, Chile was found on a black and white postcard on Flickr. (See first listing in sources below.) The image here has been altered from the original photo, though. A child that was in the foreground, and a horse on the right have been taken out of this photo. Also, ours is more cut off on the right, while the black and white image is more cut off at the bottom. 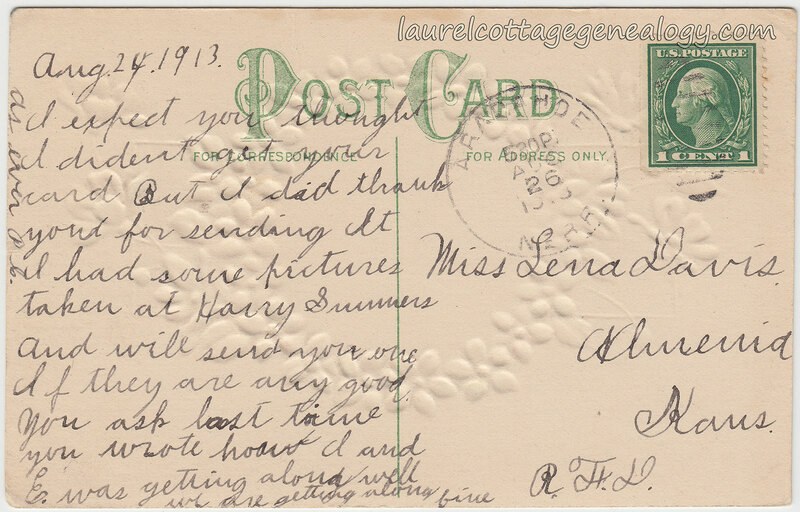 This is the second time we’ve come across this type of photo altering for postcards. (See the Chinatown post.) And according to the Flickr author, from a quick online translation to English, this street name changed several times. It was Manuel Antonio Matta Street; in 1872 it was called Nuevo Mundo; in 1892 Angamos Street; and in 1917 went back to Manuel Antonio Matta Street; in 1927 don Oscar Fuenzalida, Segundo Alcalde de la Junta de Vecinos de la Municipalidad, (Google translates as Second Mayor of the Neighborhood of the Municipality) tried to have it changed back to Angamos, but the request was not approved…..There are a couple of shops on the right that we can read the names of: Pastelería Jockey Club (pastry shop) and Botica y….the rest of the shop name shows up on another postcard found online as Drogueria, so that was a pharmacy and drugstore. What is the man in the green jacket looking for (or at)? The area in and around Antofagasta is known to be rich in minerals, perhaps he is rock hunting? 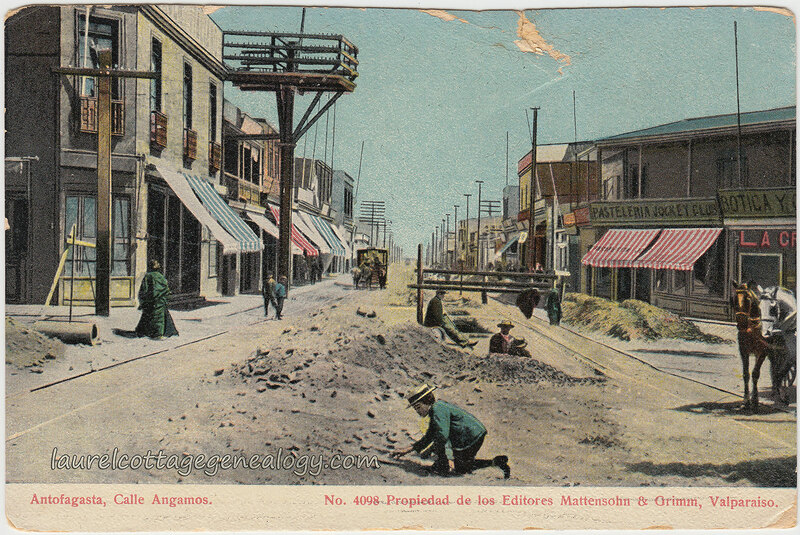 As to the piles of dirt in the middle of the street: A Wikipedia entry states sewer construction was ordered in 1905 in the city of Antofagasta, and it does look like we’re seeing a couple of rectangular shaped holes that have been dug in the ground further back in the photo. Plus, notice how on the left behind the woman on the street, there is a large pipe. So, sewer construction is the best guess. 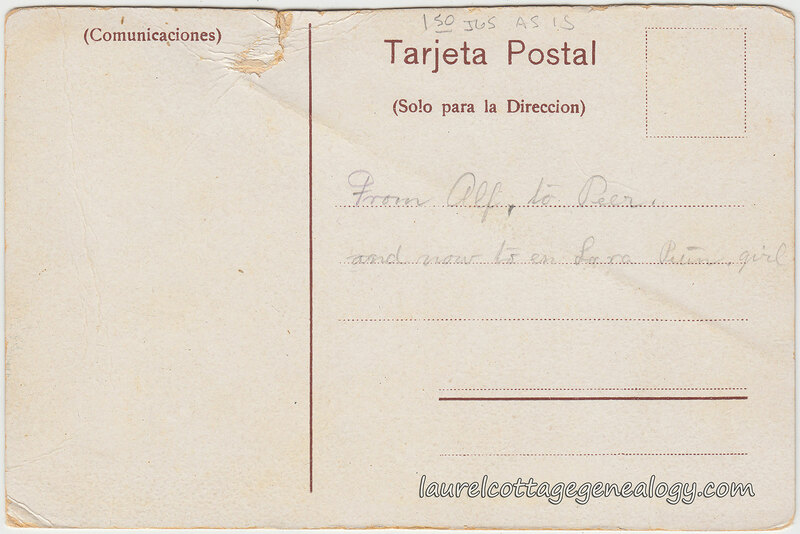 The back has some writing in pencil on the address side which appears to read “From Alf to Peer and now to en[?] Lora Petin, girl.” Anyway, this is my best guess on the last part. 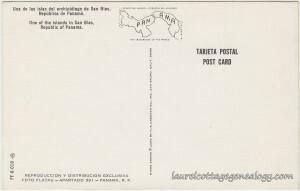 Though this postcard is not in the best of shape, it is the only one that I’m seeing online as of the date of this post, and prices seem to be varying wildly for old Chilean postcards. Divided back, unused with writing. Propiedad de los Editores Mattensohn & Grimm, Valparaiso. Circa 1905 – 1915. Sources: “Vista hacia el sur desde las calles Matta esquina Prat en Antofagasta, Chile. 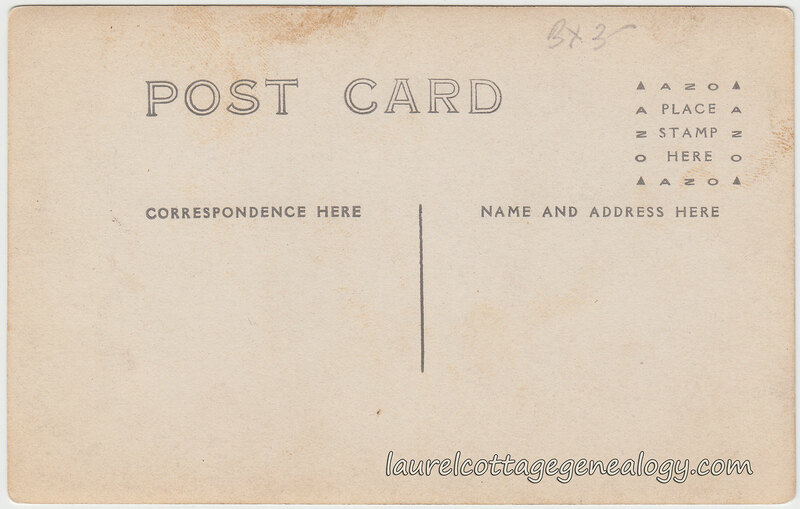 Circa 1915.” by “Aliwenco.” Copyrighted. https://www.flickr.com/photos/76983769@N00/378539392/ (accessed October 21, 2014). Antofagasta. n.d. http://en.wikipedia.org/wiki/Antofagasta (accessed October 21, 2014). Atacama Desert. n.d. http://en.wikipedia.org/wiki/Atacama_Desert (accessed October 21, 2014). 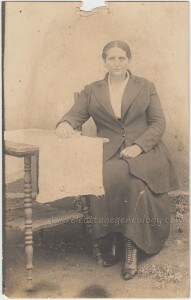 Real Photo Postcard of an unknown woman with a rather intent gaze. She looks to be possibly in her 50s, has dark hair, slightly graying at the sides, worn pulled up and back and parted in the middle. She wears a long skirt and a matching long jacket that’s designed with wide lapels and a velvet collar, and a white blouse, and heeled lace-up boots. She is outside as evidenced by the rustic setting, the ground showing as dirt with a couple of small weeds, and directly behind her is what looks like an adobe-type wall. Her arm rests on a book (a common photo prop) which lays on top of a small cotton or linen towel or table runner that is draped over the table. 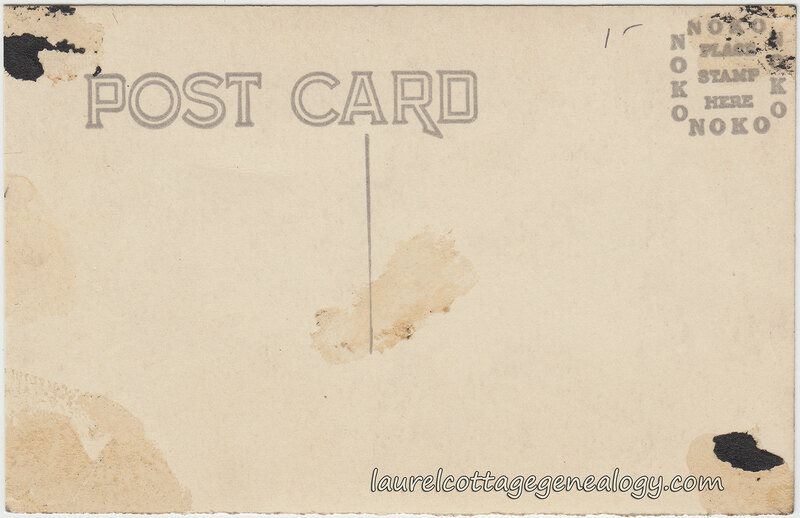 The black marks on the back of the card show that this postcard had been saved in someone’s photo album, but at some point it must have been in an oval frame since we can see the darker oval shape over the center of the photo. 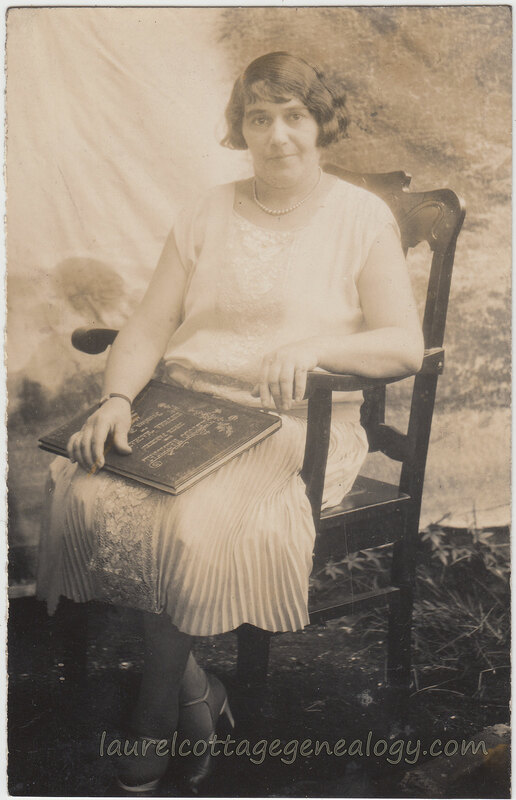 The stamp box is an AZO with two triangles up, two down, which is estimated as dated between 1910 – 1930, but the photo may be from closer to the late 1910s or early ’20s. We also might get the impression that this was taken in one of the Western states, maybe Arizona, New Mexico or California. It was found in Salinas, California. 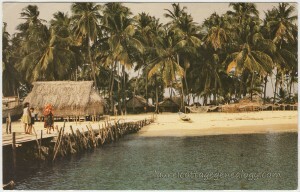 Real Photo Postcard, unused. AZO stamp box. Circa 1910 – 1920. This is an old advertisement that someone had pasted on to a piece of cardboard, not in pristine shape due to the crease running across the middle, and I suppose due to the fact that it was pasted at all. The brand was called “As You Like It” and was made by the U.S. 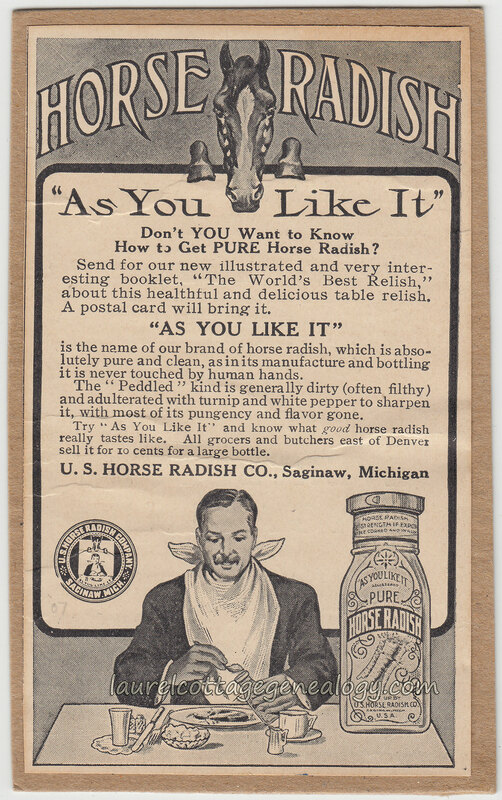 Horse Radish Co. of Saginaw, Michigan. As you can see it was advertised as “absolutely pure and clean, as in its manufacture and bottling it is never touched by human hands.” Going on to say that the ” ‘Peddled’ kind was generally dirty (often filthy) and adulterated with turnip and white pepper to sharpen it, with most of its pungency and flavor gone.” This particular ad can be found in the July – December 1907 Life magazine. (I love the horse.) And 10 cents for a large bottle. Imagine! Records were found from 1903 through 1912 for this company. The earliest being a U.S. Patent Office record shows an entry of “40, 207. HORSERADISH. Julius C. Vogt, Saginaw, Mich. Filed Mar. 16, 1903 AS YOU LIKE IT The words ‘As You Like It.’ Used since October 1902.” A 1904 factory inspection publication shows for April 14th, (only naming the city for the address) under the heading of “Sausage and mincemeat” for “Kinds of goods manufactured or handled” that they were employing 7 men, 4 women, and no one under age 16. The Polk’s Saginaw City Directory for 1909 has a listing as follows: “UNITED STATES HORSE RADISH CO, Wallis Craig Smith Pres, J C Vogt Vice-Pres and Genl Mngr, Emil F Vogt Sec, Otto W Vogt Treas, Mnfrs and Producers of ‘As You Like it’ Food Products, 219-223 N Water, Tels Mich 334, Val 554.” One of the 1912 references found shows a different address of 219 N. Tilden St. in Saginaw. This company sold many other products including sea foods, breakfast cereals, popcorn and peanut butter. Reading the ad posted here brought up a funny childhood memory of Dad often making a joke that something was “untouched by human hands” if for example you were being passed something at the dinner table. 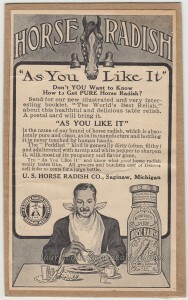 But since Grandpa “Pappy” was born and raised in Saginaw, I wonder if this saying was something that had passed from father to son, having originated with the As You Like It horseradish ad. It’s possible. This brings up the idea in general of those kind of “running jokes.” What tickles us? What phrases do we hold on to for that reason, and even communicate with? And after storing up tons of phrases over the years, how many days in a row could you use only them (provided the person you’re talking to is with you on all the jokes) to communicate with? A very small portion of the sayings flying around in my household are: “The defense is wrong…I wore this ridiculous thing for you… the two ‘yutes’…Does that thing come turbo-charged? Only on the floor models.” (from My Cousin Vinny) “President Not Sure…idiocracy…Now back to you, Formica…We got this guy, Not Sure, and he’s gonna fix all the problems in the world, and he’s gonna do it all in one week.” (from Idiocracy – and I may have that last line wrong, I’ll update it later if needed) “Your vacuum cleaner ate my pants; there was nothin’ I could do.” (Pepsi ad with Dave Chappelle) “My room was filled with long-stem roses, my butler knew exactly how I took my tea, I was not to be awoken before 10 a.m., I think of this as a temporary exile.” (Celebrity? Lines Cruises) “I’m outdoors you know…the clock on the wall says 3 o’clock…everybody funny, now you funny, too…Lord, she was lovey-dovey…That don’t befront me, long as I get my money next Friday.” (George Thorogood’s version of “One Bourbon, One Scotch and One Beer”) “I see you T. Hunter” (or whoever has just made a great play, or gotten a big hit, from Rod Allen, Detroit Tiger baseball analyst) “He’s got summer teeth – some are there, some are not.” (from Mickey Redmond, Detroit Red Wings analyst)….Along these lines, my friend and her sister have something they call “the funny list” – all the stuff over the years that they crack up over. Same friend and I crack up over two words – Donut Nation, the name of a donut shop. Hmmm, well maybe this title is a bit awkward, but here is beautiful photo of a nice-looking, middle-aged gentleman. 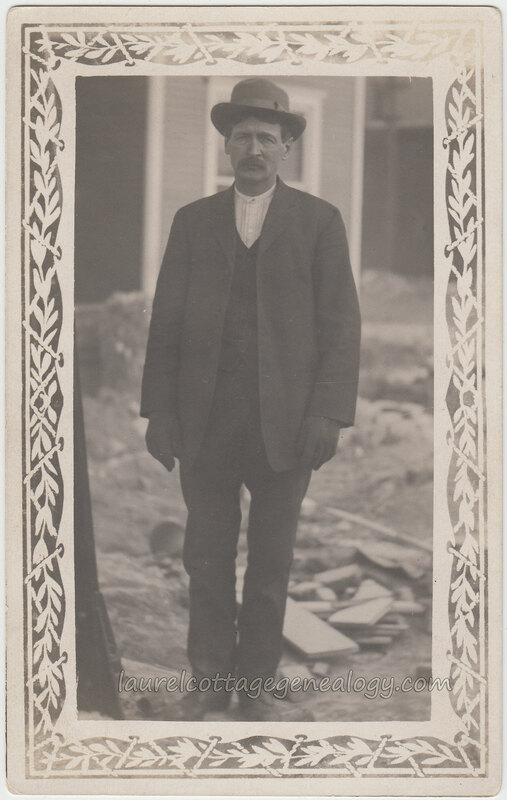 He has a mustache, and is dressed in a suit, hat and gloves. His shirt shows a band type collar; this type could also be worn with the many varieties of the detachable collar. The hat is banded, and perhaps the style is best described as a bowler a.k.a derby, though if someone can come up with something more exact, do please let me know. This Real Photo Postcard is unusual because of the border. This is the first I’ve seen like this, and it’s really lovely, although faded at the top. It shows a leaf pattern with a rope design lacing back and forth over the leaves, giving the appearance of the man’s photo being on a canvas, and the rope holding the canvas unfurled for us to view. Last but not least, it looks like this photo was taken in front of a house that had just recently been built, due to the uneven ground and the scraps of boards in the background. Divided back, unused Real Photo Postcard. AZO stamp box, circa 1907 – 1918.